274th day of the year. There were then 91 days left in 2018.
on the 40th week of 2018 (using US standard week number calculation). 10th day of Fall. There were 81 days left till Winter. 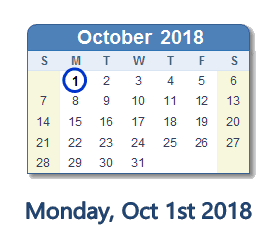 What happened on October 1st 2018? Tom Cotton on "Face the Nation": Christine Blasey Ford "victimized by Democrats"
Trump jokes 'can you imagine' if I drank?